"Written by one of the world’s leading psychologists on evolutionary approaches to mental health problems Living Like Crazy looks into the sources of our craziness, cruelty and mindless callousness rooted in evolved gene-based strategies for nepotism, tribalism, power-seeking, greed and self-absorption. He reveals how cultures can accentuate or dampen these dark-sides of our nature. Yet we have the potential to create a very different type of mind and social world. With insight into the nature of our minds we can purposefully cultivate our evolved capacities for compassion and altruism. There are many indicators that this is now happening. Based on previously unpublished writings, this is a wonderful book that brings our focus to both the dark sides of our nature, but also to how compassion is our path to alleviate our own, other people’s, and societies suffering." Paul Gilbert is a global force in the science of compassion. In this fascinating book, Gilbert takes us far beyond the psychology of meditation. Living Like Crazy guides us on a journey to a radical sanity - that might just change your life. If you have enjoyed learning about mindfulness or self-compassion, do yourself a big favor and begin reading Living Like Crazy today. Dennis Tirch PhD, author of The Compassionate Mind Approach to Overcoming Anxiety, founder of The Center for Compassion Focused Therapy in NY, USA. Living Like Crazy by renowned international compassion and evolutionary psychologist Paul Gilbert dives into our innate potential for some of our dark sides of power, tribalism, status, aggression, cruelty and war. He reveals how the competitiveness of modern life can act as the perfect echo chamber that magnifies our less appealing qualities. Gilbert plants many seeds of compassion throughout the book as a way of helping orient the mind to bring the best out of ourselves and humanity. The book is a refreshing insight into the craziness of human living and provides excellent insights into the mind from a range of perspectives including evolution, neuroscience, culture, and philosophy. It is a must-read book and confirms Gilbert as a one of the most original and forward thinkers of our time. Paul Gilbert has created another masterpiece about the mind, and about how its archetypal potential can be dangerously shaped by culture, inadvertently forcing us to live in crazy and destructive ways. This book gracefully nudges us to recognise the costly psychological defenses that we use to cope with the reality of suffering and how cultivating compassion can enable us to hone our brains (and hearts) for increased balance, connection, health and the social good. order a copy of living like crazy directly from us BELOW. please allow 5-7 days for DISPATCH. ​Paul Gilbert, FBPsS, PhD, OBE is Professor of Clinical Psychology at the University of Derby and Consultant Clinical Psychologist at the Derbyshire Health Care Foundation Trust. He has researched evolutionary approaches to psychopathology for over 35 years with a special focus on shame and the treatment of shame based difficulties, for which compassion focused therapy (CFT) was developed. 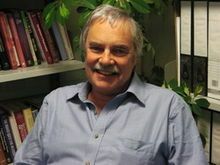 He has written and edited 22 books, including the bestselling Overcoming Depression and The Compassionate Mind, and established the Compassionate Mind Foundation in 2006. He was awarded an OBE in March 2011. ​Would you like to review this title for a journal, magazine, blog or website? Contact Hannah via houseannwyn@gmail.com to apply for a review copy.